We all have our own preferred "comfort scents," and they can be just as individual as any of our other perfume preferences. Vanilla and other gourmands might be popular in this particular category, but I'm sure there are those of you who also reach for vetiver or violets or what-have-you when the going gets rough. I've been noticing for the past year or two that when I'm dealing with bad news, or a headache or bad cold, or just the end of a long day, I end up looking through my stash for samples of natural perfumes. Velvet & Sweet Pea is one line that never fails to soothe my spirit with its scents (not to mention its colorful Victorian-style imagery, including lots of cats!). I'm a longtime fan of Black Cat, and recently I've tried two newer perfume oils called Rose Encens and Eze that have eased me through moments of stress. Rose Encens is a "sensuous and warm" composition of blood orange, lime, rose and frankincense "in perfect harmony," and I have to agree: the fruit, floral and resin notes are very smoothly blended. The blood orange is deep and sweet. I wouldn't mind more rose, but I realize that true rose oil is very costly, and what I do smell here is lush. The incense turns out to be the star of Rose Encens: it's aromatic and rich but not overwhelming. I'm also detecting a woody cedar-ish note in the dry down. Overall, I only wish Rose Encens lasted longer on me; after two hours or so, it's faded to a faint trace on my skin and I want to reapply. At least I keep getting the same effect when I do: this fragrance lets me exhale gently and makes me feel reflective yet "centered." Eze, on the other hand, feels more outward-looking and uplifting. It's described as a tribute to the village of Eze on the French Riviera, with Mediterranean-inspired notes of lemon, lavender, rose geranium, myrtle, jasmine and labdanum rock rose. It smells like a lively and appropriate homage to classic Eau de Cologne, with its mix of herbal and citrus notes (heavy on the tart lemon) crowned by a few jasmine petals. The myrtle and the resin in the base add texture, and I'm guessing it's the resin (the labdanum) in particular that has a soothing effect on me, while the fruit notes add some cheer. I'd hate to limit Rose Encens and Eze by describing them as "aromatherapy" when they're fully realized botanical perfumes; but perhaps they can be both! I'm glad I've had them on hand lately, in any case, and I'd suggest sampling them if you're interested in exploring natural perfumery or you just want to cleanse your olfactory palate for spring. Velvet & Sweet Pea Rose Encens ($64) and Eze ($45) are both available as 5 ml perfume oil. A sample set of Rose Encens and Eze, plus another scent named Highway, is also available ($20). All can be found at the Velvet & Sweet Pea Purrfumery website. Adding these to my to-sample list! I’ve been wearing my naturals frequently, and these two sound appealing. I think you would like this perfumer’s style! It’s neither “crunchy” nor overwhelming. Very wearable…but they still feel like perfumes, not just oils that you’d buy at Whole Foods. They both sound great. Eze sounds like my “thing” ???? I wonder if a nicely coordinated body oil would help with the longevity? I bet it would! I recently ran out of my Burt’s Bees body oil, which had a great lemon scent…it would have paired well with Eze! Wow! 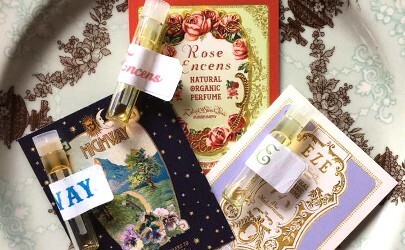 thank you so much Jessica, for this delightful review of my new perfumes! I love that you feel their aromatic richness and that they sooth your spirit, and also that you appreciate my fanciful packaging. My job is done! Bless your sweet heart, as my Nana used to say.